This title is out of stock, but the full text of the study can be read here. Pages: 184 Dimensions: 8.5" x 11" x .5" Weight: 1 lbs. 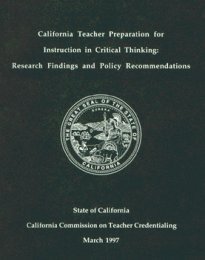 This is the first comprehensive study, based on rigorous research methodology, which quantitatively and qualitatively determines the extent to which college faculty typically teach for critical thinking, the methods faculty use to teach critical thinking, how well faculty can distinguish between high quality and low quality thinking, the extent to which faculty can articulate their understanding of critical thinking, and the extent to which prospective teachers are prepared to teach critical thinking. Results are based on a study of randomly selected California professors from 38 public and 28 private colleges and universities.